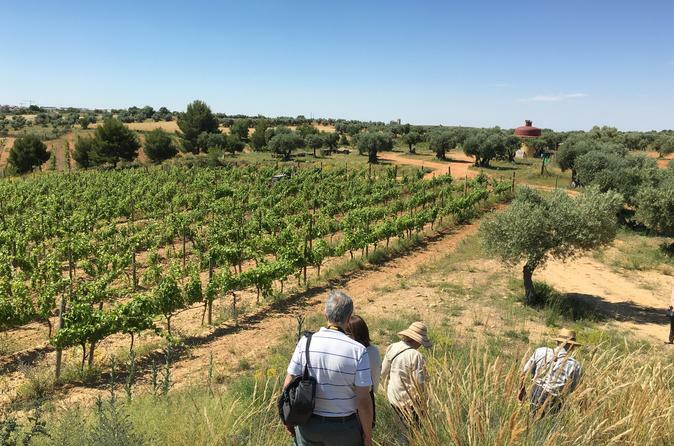 The half-day tour near Madrid is wonderful for wine lovers wishing to learn a bit more about Spanish wines while enjoying a gorgeous vineyard setting. We will discover a family-owned winery producing artisan and top-quality wines within the Designation of Origin “Vinos de Madrid”. We will be able to meet the winemaker and have a chat with him about his wines, which have been awarded prizes over the last years. You will learn how wines are made; the grape varieties growing in the area and their specificities; the particular terroir where vines grow and the winemaking techniques used; followed by a delicious wine tasting pairing gourmet tapas and top-quality wines. You will be guided by Jimena, a highly experienced wine and heritage expert and really passionate about wines! We will be meeting near the Prado Museum at the entrance of Restaurante Comala, Plaza de la Lealtad, 3 (28014 Madrid) at 10:00 am (please be 5 minutes in advance) to start our 45 minutes ride to the winery in a comfortable car or minivan. We will start our wonderful wine experience by visiting one of the vineyards belonging to the winery where we will meet the winemaker. You will experience first-hand how vines are grown (the grape-growing techniques) and the specificities of the climate and the terroir and how they affect the grape varieties growing in the area. A really interesting and informative explanation followed by a short walk in the vineyard. We will then head to the winery (5 minutes away) in order to visit the premises and get useful insights about the winemaking process for each of the wines: the alcoholic fermentation, the ageing system and their classification in Spain according to the wine region and the ageing characteristics. This is a family-owned winery; you will meet and be greeted by members of the family, all very genuine and passionate about what they do! After this, you will enjoy a wonderful wine tasting of 3-4 wines paired with tapas. You will obtain valuable tips about how to taste the wines, as well as some wine tasting descriptors to enjoy the wine tasting experience to the fullest! We only do very small groups to ensure the genuineness of the experience, a high-quality standard and a really personalized tour. This will be a memorable wine experience for you to remember as a highlight from your trip to Spain as our customers have already rated us!